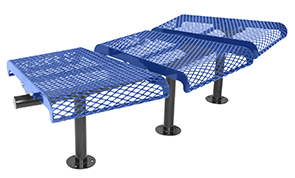 Build a unique, inviting space with the flat expanded metal concave plaza bench. These all-steel 15° convex flat benches are popular for installation along walkways and sidewalks in office parks and busy downtown areas. Designed to withstand heavy weather and traffic conditions, the #9 expanded metal diamond pattern seats is supported by a powder-coated 2-3/8"O.D. steel tube frame. The smooth, rounded edges and concave design enhances the user comfort and safety Combine this unit with the matching site amenities for a playful setting. Effectively install a variety of seating opportunities with the portable, surface and in-ground mounting frame options available.